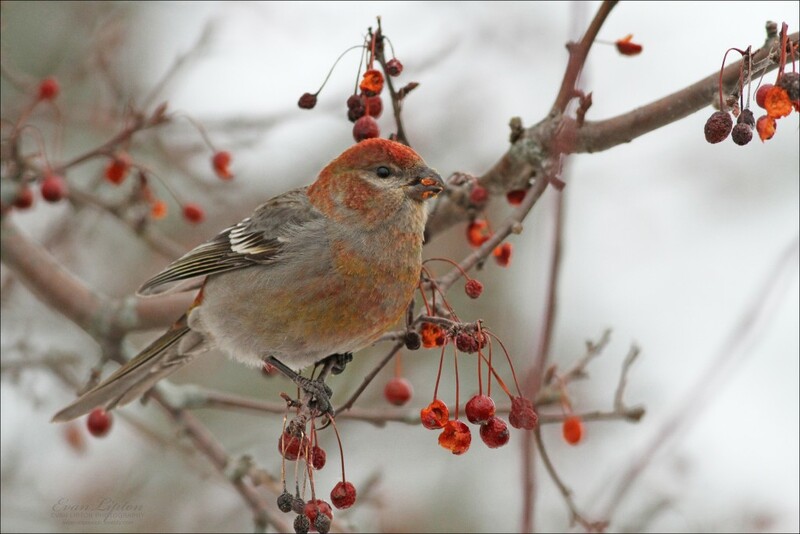 Male (above) and female Pine Grosbeaks, photographed in Newburyport, Mass. Photos courtesy of Evan Lipton. © Evan Lipton 2013. There were a good many Pine Grosbeaks scattered along the line of ashtrees on the ridge to my left and as I approached Mt. Auburn Street their numbers increased until upon reaching Mr. Hayes’s place I found the trees literally alive with them. Soon after I stopped to look at them they began flying from every direction into a large white ash which stands near the foot of the avenue. This tree was loaded with fruit and with snow clinging to the fruit clusters and to every twig. In a few minutes it supported also more than a hundred Grosbeaks which distributed themselves quite evenly over every part from drooping lower to the upright upper branches and began shelling out and swallowing the seeds. The rejected wings floated down in showers and soon began to give the surface of the snow beneath a light brownish tinge. The snow clinging to the twigs and branches was also quickly dislodged by the movements, of the active, heavy birds and for the first few minutes it was continually flashing out in puffs like steam from a dozen different points at once. The finer particles, sifting slowly down, filled the still air and enveloped the entire tree in a gauzy veil or mist tinted, where the sun-beams pierced it, with rose, salmon and orange, elsewhere of a soft, dead white and of incredible delicacy and beauty, truly a fitting drapery for this winter picture- the hardy Grosbeaks at their morning meal. They worked in silence when undisturbed and so very busily that at the end of an hour they had actually eaten or shaken off nearly half the entire crop of seeds. Some men employed in a marble cutter’s shop near the tree were neglecting their tasks to watch and discuss them. One of these men told me that a few Grosbeaks were seen in the tree late yesterday afternoon. This was the great Grosbeak day; the city was simply flooded with them. Whenever or wherever I stepped out of doors I saw flocks of varying sizes flying overhead and the sound of their piping was always in my ears. Just after breakfast I took a walk up Brattle Street and found an immense flock feeding in an ash heavily laden with fruit in Mr. Piper’s place on the corner of Fayerweather Street. I counted 149 birds in this tree and there were fully half as many more in another ash in front of Mr. Richardson’s house on the opposite side of Brattle Street to Miller’s hearing Grosbeaks continually & seeing several flocks of from 30 to 50 birds each. They were in Hubbard Park the whole day and I saw a few on my own place but more visited the old cedar tree. I had sent word to Faxon of this condition of things and at half-past three he arrived and we went together to the Piper place where we found the birds even more numerous than had been in the morning. They had stripped both ash trees and were operating on the fallen fruit. Over the space covered by the spread of the branches of the Piper ash they were crowded together so closely as almost to conceal the snow[.] We divided into halves and made a rough count Faxon getting 108 and I 115 birds. We missed some and there were others in the trees and on the roofs of the neighboring houses. 250 would be a low estimate for the total number assembled here at this time. They attracted much attention from the passers by and people in sleighs & on foot were continually stopping to look at them. One man asked if they were “harbingers of spring”, a question which gave us some grim amusement insomuch as we were suffering from the bitter cold and unable to stand still for more than a minute or two at a time. I visited the Hayes place this morning and again with Faxon in the afternoon but saw only a few stray Grosbeaks there. The men at work in the marble yard told me that the birds finished the fruit of the big ash before sunset yesterday. They spent most of the afternoon eating the fallen buds. Although Grosbeaks have continued very numerous through the day in the vicinity of my place their numbers have decreased very considerably as compared with yesterday – quite one half I should say. They have evidently exhausted the food supply hereabouts and are departing in search of fresh fields. Brewster’s notes were the basis for an article published by the American Ornitholigsts’ Union in the ornithological journal ‘The Auk’. 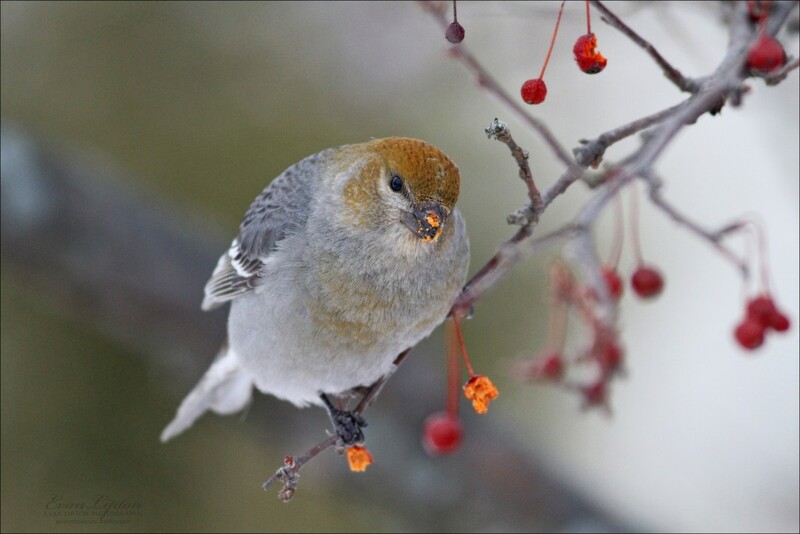 You can read Brewster’s article, ‘A Remarkable Flight of Pine Grosbeaks (Pinicola enucleator)’ at the Biodiversity Heritage Library website.